Get trusted forecasts at your fingertips with the Bureau of Meteorology's new app and top five weather tips for boaters. Each year marine rescue organisations respond to thousands of calls for assistance from boaters operating in Australian coastal waters. As the need for assistance is often caused by the weather, understanding the impact of weather hazards can help boaters be better prepared or change their plans for safer conditions. 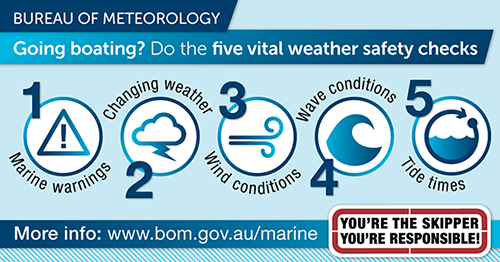 Get a detailed insight into the five vital weather safety checks at the BoM marine knowledge centre. BOM Weather — the Bureau's free weather app — is available for iPhone and Android smartphones, giving you the most accurate weather information as you move around. The app provides the weather information most people want to access quickly and easily — including the radar, current weather warnings, three-hourly forecasts for the day ahead, and daily forecasts for the week ahead. Users can view weather information for their current location, other favourite locations and capital cities. For more information visit www.bom.gov.au/app. You can also find out how to get the best out of the BoM MetEye service in this video.